Place a STEAMPlus Integrator in the middle of the load or inside the densest pack at least once daily. A STEAMPlus Integrator should be used in every load containing an implantable device. Recording of results biological monitoring is mandatory. Keep a separate record for each sterilizer in the office. Sure-Check Sterilization Pouches – to be used in each load. STEAMPlus Class 5 Sterilization Integrators – to be used every day or every load. ConFirm 10 In-Office Biological Monitoring – to be used at least weekly. Sure-Check is a self-sealing sterilization pouch with external and internal multi-parameter steam indicators (time, temperature and saturated steam). The indicators change color for visible confirmation of effective sterilization parameters, and the pouches are available in five sizes. 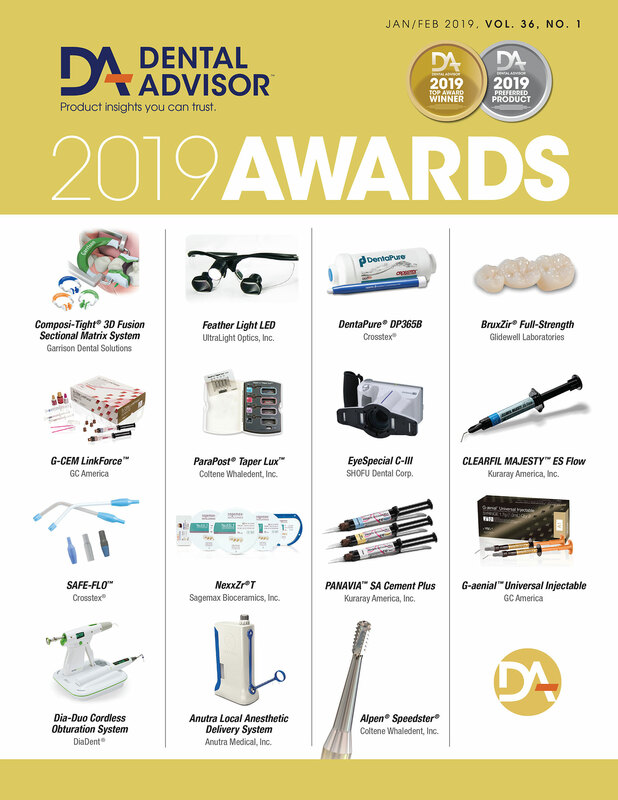 STEAMPlus Class 5 Integrators are more sensitive than the indicators on the pouches and are used with steam sterilization cycles to provide a definitive pass/fail result. The STEAMPlus Integrator is placed in a Sure-Check sterilization pouch along with a normal load in the center or middle of the load. The indicator bar moves from left to right during the sterilization cycle and enters the blue “SAFE” area when all three sterilization criteria have been met. ConFirm 10 is an in-office biological monitoring system that can be used instead of a mail-in program. Using the Confirm 10 incubator, final results are available in only 10 hours. The Confirm 10 vial is placed in a Sure-Check sterilization pouch along with a normal load in the center or middle of the load. After sterilization, the Confirm 10 vial is crushed to release a liquid medium, and then placed in the ConFirm 10 Incubator along with a crushed unprocessed Confirm 10 vial which acts as a Control. After incubation, a color change in the Confirm 10 vial is read to determine pass/fail results. A booklet is included for recording results. 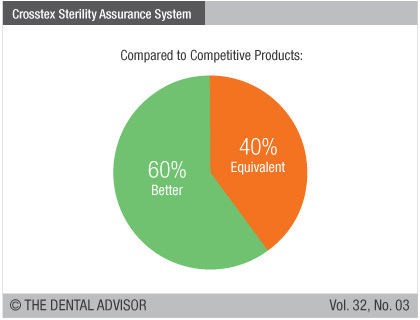 Crosstex Sterility Assurance System was evaluated by 15 consultants during a 30-day period. 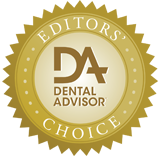 This sterilizer monitoring system received a 93% clinical rating. 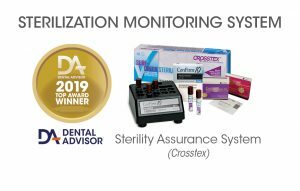 Crosstex Sterility Assurance System provides dental offices peace of mind that their sterilizers are performing effectively. 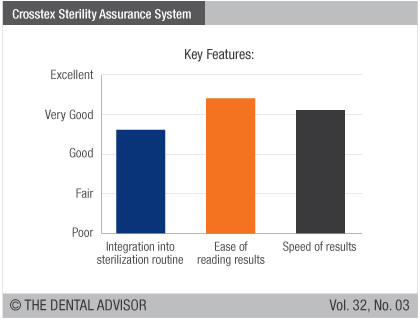 The components of the system are easy to use and integrate into the sterilizer monitoring procedures. The Sure-Check Sterilization Pouches had a familiar feel to users, and the indicators were reported to be easy to read. The presence of an indicator inside the pouch make the results more valuable. STEAMPlus Integrators were equally user-friendly with a blue bar providing clearly visible results. Knowing that these strips are classified to perform equivalent to biological indicators was reassuring to dental personnel; however, they do not replace use of weekly BIs for compliance testing. Using the ConFirm 10 In-Office Biological Monitoring required a period of adjustment in terms of timing to allow overnight incubation of the vials. Crushing the vial is required for activation, and that was not always easy to accomplish. The benefit of a quick result, compared to mail-based systems that take one or more days, was reported to be worth the extra effort. In large offices with multiple sterilizers, recording results became cumbersome. 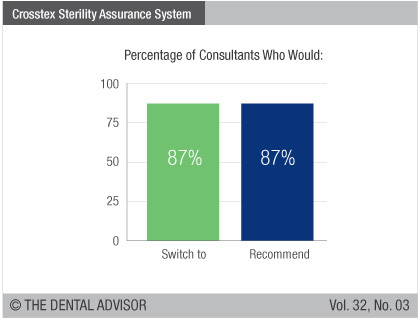 Ninety-three percent of consultants reported that implementing the Crosstex Sterility Assurance System gave them added confidence in their sterilization procedures and outcomes.